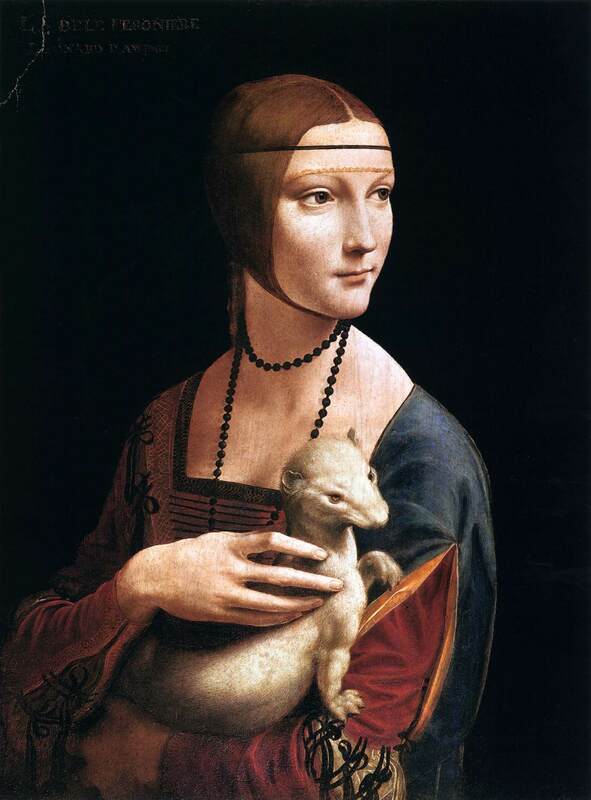 Leonardo da Vinci (1452–1519), Lady with an Ermine (Portrait of Cecilia Gallerani) (c 1489-90), oil on walnut, 54.8 x 40.3 cm, Czartoryskich w Krakowie, Kraków, Poland. Wikimedia Commons. Late in 1478, when still working in Florence, Leonardo wrote that he had started work on two paintings of the Madonna, one of which does seem to have survived, and now hangs in the Hermitage in Saint Petersburg. Leonardo da Vinci (1452–1519), Madonna with a Flower (Benois Madonna) (c 1481-83), oil on wood transferred to canvas, 49.5 × 31 cm, Hermitage Museum Государственный Эрмитаж, Saint Petersburg, Russia. Wikimedia Commons. His Madonna with a Flower, popularly known as the Benois Madonna, is thought to date from 1481-83, and was preceded in the years 1475-80 by numerous sketches and studies of the Madonna, including several which are strongly linked with this composition. 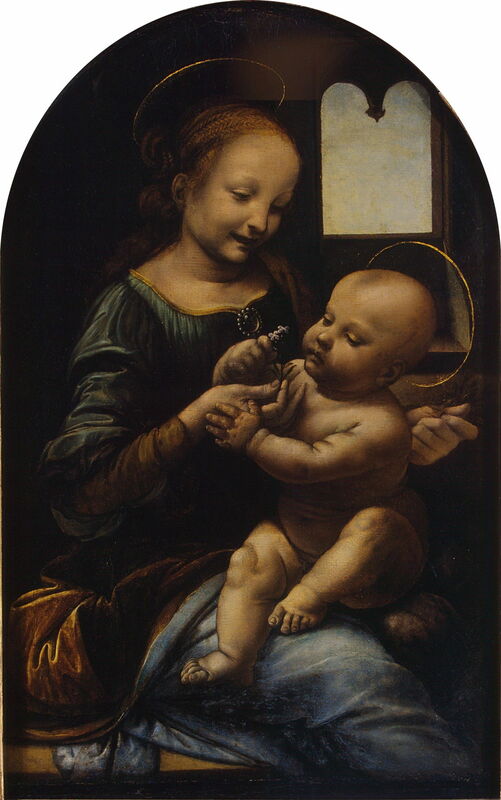 Examination of the painting reveals many pentimenti: the infant’s head was originally larger, and the grasses held by the Madonna in her left hand were originally flowers. The flower of the title, on which the baby’s attention is concentrated, is a crucifer, making reference to Christ’s crucifixion. The work’s modern nickname refers to Louis Benois, who owned it before it was purchased by the Hermitage early in the twentieth century. Leonardo da Vinci (1452–1519), Adoration of the Magi (design study) (1478-81), pen and ink over silverpoint on paper, 28.5 x 21.5 cm, Musée du Louvre, Paris. Wikimedia Commons. At the same time, Leonardo had started work on a painting that he didn’t complete. 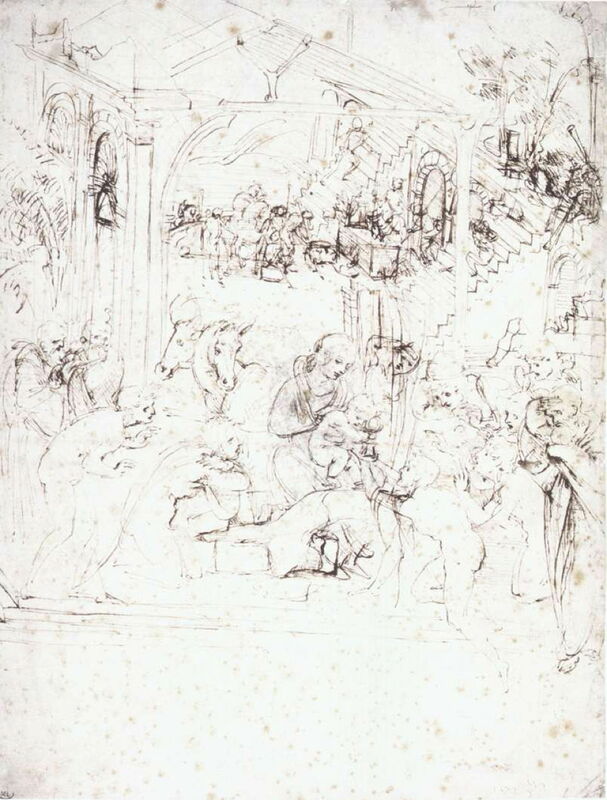 This early design study for the Adoration of the Magi is thought to have been made around 1478-81, and has many close similarities with the painting that Leonardo abandoned in 1482, although he changed his mind about the ruins in the background and added a prominent tree to the right of the Virgin Mary. Leonardo da Vinci (1452–1519), Adoration of the Magi (perspective study) (c 1481), pen and ink, traces of silverpoint and white on paper, 16.3 x 29 cm, Galleria degli Uffizi, Florence, Italy. Wikimedia Commons. That was probably followed by this perspective study, thought to date from around 1481. 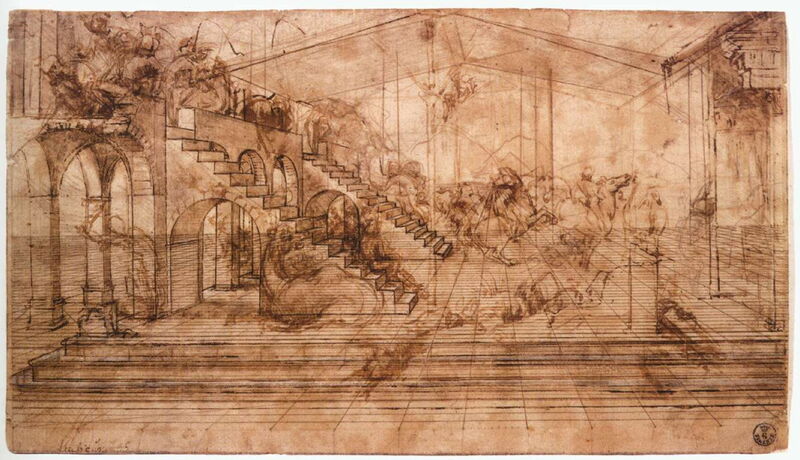 The ruins shown in the painting below were thus part of a complete building which Leonardo imagined and projected meticulously before excerpting those fragments which were to be retained in the final work. This may have been intended to represent the palace of King David, which referred to Christ’s lineage. 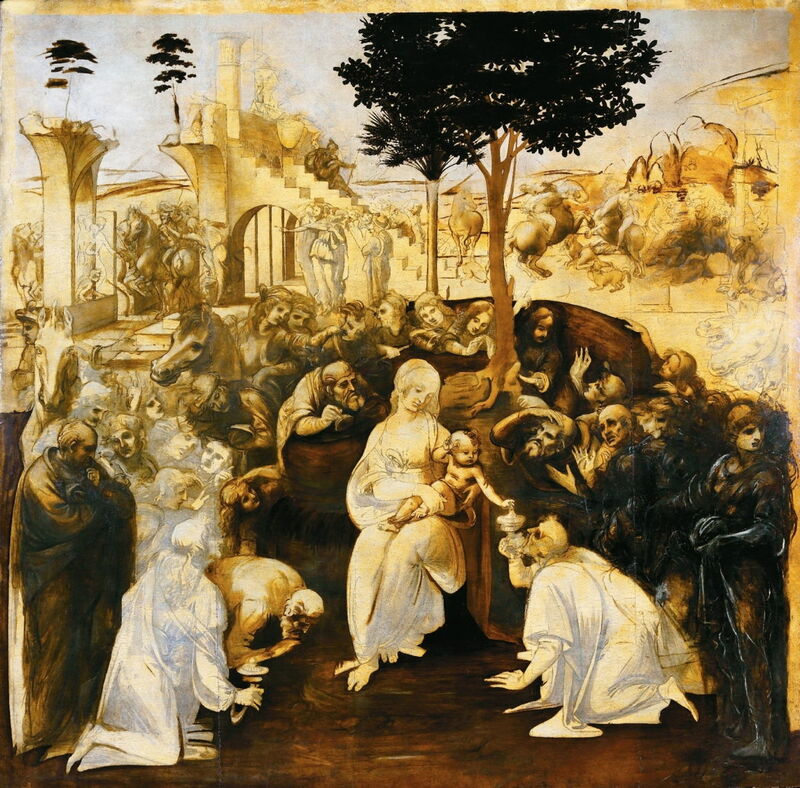 Leonardo da Vinci (1452–1519), Adoration of the Magi (abandoned) (1480-82), oil and tempera on panel, 243 x 246 cm, Galleria degli Uffizi, Florence, Italy. Wikimedia Commons. He most probably started the Adoration of the Magi in or soon after 1480. At nearly 2.5 metres in each dimension, it was one of his largest and most ambitious works to date, but probably had to be abandoned when he left Florence in 1482. This work had been commissioned in March 1481 by the monks of San Donato a Scopeto, just outside the city of Florence, for their high altar, who imposed complex financial obligations which Leonardo may also have been unable to meet. Another painting attributed to Leonardo which may have been abandoned at the same time is a portrait of Saint Jerome. In 1482, Leonardo was despatched north to Milan in an effort by the Florentine ruler Lorenzo de’ Medici to secure peace with the Duke of Milan, Ludovico Sforza. He took with him a diplomatic gift of a silver lyre in the shape of a horse’s head which he had made. Leonardo remained in the court of Milan until 1499, busy with a succession of design and other projects, and some of his greatest paintings. 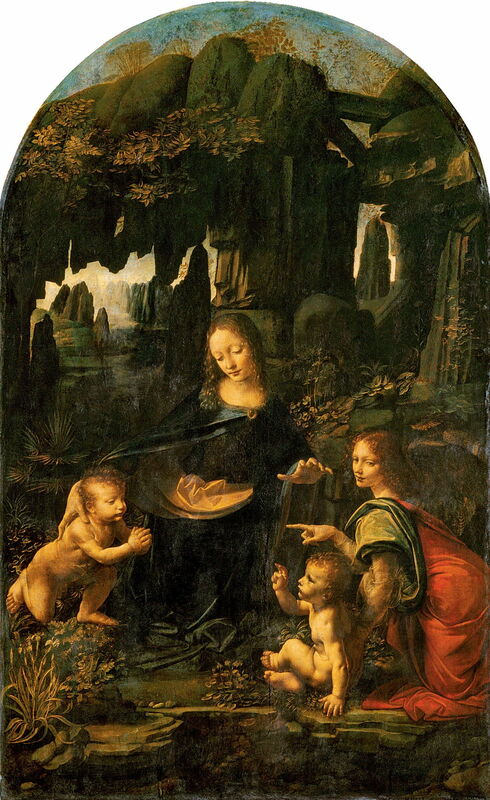 Leonardo da Vinci (1452–1519), Virgin of the Rocks (first version) (c 1483-85), oil on wood transferred to canvas, 199 x 122 cm, Musée du Louvre, Paris. Wikimedia Commons. Soon after his arrival in Milan, Leonardo embarked on the first version of one of his most famous paintings: the Virgin of the Rocks now in the Louvre in Paris, which was probably completed between about 1483-85. It is generally agreed to have been commissioned in 1483 for the Confraternity of the Immaculate Conception of San Francesco Grande in Milan, where it was to form part of a large wooden altarpiece. Its complex multi-figure composition, set in an elaborately detailed landscape, makes this the most ambitious of Leonardo’s early paintings. The central figure is the Virgin Mary, whose right hand clasps the back of the infant Saint John the Baptist. With her is an angel, whose left hand supports the lower back of the younger baby Jesus. Looking just at the figures there are many complexities, including the hand positions which direct towards the clasped hands of John, and directions of gaze. As is traditional, the Madonna’s eyes are cast down, but the angel is looking towards the lower right corner of the painting. Christ is distinguished by his right hand held in blessing, and his evident youth compared with the larger John who is praying for him. The landscape is richly detailed, with an abundance of symbols. Palm leaves behind the infant John are associated with the flight to Egypt, and with the Passion, and it has recently been proposed that they model scallop shells, which lead into another symbolic realm altogether. It is thought that there were contractual disputes over the value of the completed painting, and this first version was eventually sold to someone else. A replacement, its second version now in the National Gallery in London, was probably started soon after 1490, but wasn’t accepted until 1508, when the artist was finally paid. This painting has clearly had a hard life, and in 1806 was transferred from its original panel to canvas, which could only have exacerbated its deterioration. During this period, Leonardo is thought to have painted at least one portrait, that of a Lady with an Ermine, showing Cecilia Gallerani, which he completed in about 1489-90. Cecilia was the mistress of Ludovico Maria Sforza, and Leonardo’s work made such an impression at court that Bernardo Bellincioni, a poet there, wrote a sonnet celebrating this painting. The ermine is an unusual animal for such a portrait, but has two distinctive links. Its Greek name γαλέη (galée) is a pun on Cecilia’s surname of Gallerani, and King Ferrante of Naples bestowed the Order of the Ermine on Ludovico, who then became dubbed Italico Morel, bianco eremellino, ‘Italian Moor, white ermine’, by Bellincioni. Cecilia became Ludovico’s mistress in early 1489, when she was fifteen years old. He married Beatrice d’Este in January 1491, when Cecilia was five months pregnant with his son, and the court poet Bellincioni died young the following year. It is therefore most likely that Cecilia was little more than sixteen at the time that Leonardo painted this portrait of her superlative beauty. As Ludovico’s power stabilised in the 1490s, Leonardo was engaged in the Sforza equestrian monument, struggled on with Virgins of the Rocks, and started on The Last Supper. Posted in General, Life, Painting and tagged da Vinci, painting. Bookmark the permalink.